Daniel S. Degear has served as the DeRuyter Town Supervisor since January 1, 2008. Dan is the Vice-Chair of the Madison County Board of Supervisors and currently chairs the Madison County Government Operations Committee. Dan represents the Town of DeRuyter and Madison County at both the New York State Association of Counties and the National Association of Counties as a member of both organization's Public Safety Committees and is a Vice-Chair for the National Association of Counties Homeland Security Sub-Committee. Dan also serves on the Syracuse Regional Airport Advisory Board. Dan has a Bachelor's Degree in Business Management with an emphasis in Public Sector and also an Associates Degree in Human Service Management. Additionally, Dan has numerous certifications from the FEMA Emergency Management Institute. He is proud to be a 2014 recipiant of the DeRuyter Honored Citizens Award, an award given annually at the DeRuyter Fireman's Fair. Dan is a native of Central New York having grown up on a 7th generation dairy farm. He comes from a long-line of public servants with members of his family having served their hometown during the past as Town Clerk, Highway Superintendent, Town Council, and Greivance Board. Dan and his wife, Jessica, have two children. Their son, Nate, is attending U-Albany majoring in Emergency Preparedness, Homeland Security and Cyber Security. Their daughter, Jaidan, attends DeRuyter Central High School. Dan and Jess are often found on the sidelines of volleyball games for both the DeRuyter Rockets and the Crown City Volleyball Club. The Degear family are active members of DeRuyter's St. Lawrence Catholic Church. Dan, a proud father of an Eagle Scout, volunteers with the DeRuyter Boy Scout Troop 14 where he teaches the citizenship merit badge series. Dan is also a member of the Tioughnioga Ruritan Club where he is currently serving as the club's 2019 president. 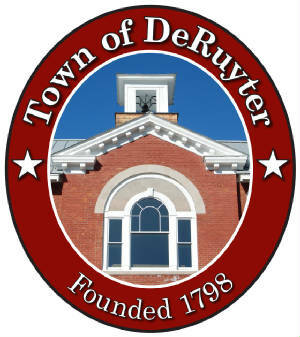 Notice is hereby given that a copy of the Annual Financial Report for the Town of DeRuyter for fiscal year ending December 31, 2018 has been filed with the State Comptroller's Office. A copy of this report is also on file in the Office of the Town Clerk where it is available for inspection during regular hours.